함바: 일시적 연대 는 동시적으로 일어날 수 없는 것들이 공존하게 되는 장소와 그 풍경을 고민하고 함께 존재한 적이 없는 이들의 만남과 연대를 상상하기 위한 계획이다. “함바”라는 말은 토목, 건설현장에서 사용하는 일본어에서 시작된 은어로, 원래 뜻은 "토목 공사장, 광산의 현장에 있는 노무자 합숙소"이다. 일본어 표기를 읽으면 '한바はんば(飯場)'이지만, 현재 한국 건설현장에서는 '함바집'으로 통용되며 현장의 건설 노동자들의 식사를 제공하는 간이 현장식당을 말한다. 매우 한시적으로 운영되는 식당인 함바집은 건설현장이 시작될 때 생겨났다가, 현장을 철수할 때 그 용도와 생명을 다한다. 그러나, 건설현장의 어느 곳 보다 가장 다양하고 많은 사람들이 오가고 모여드는 장소이자 ‘식사’를 통한 가장 보편적 인간의 욕망과 삶을 나누는 장소이다. 나는 함바집의 이러한 장소적, 내용적 함의로부터 송도 국제 신도시의 풍경을 새롭게 그려내고자 했다. 근대화와 개발에의 편집증적 욕망, 그를 통한 일련의 성취와 실패들, 그리고 크고 작은 이권의 연결망과 경합들, 사람들 간의 화해와 연대의 가능성들이 이 한시적 장소위에 모여들었다가 다시 흩어질 수 있기를 바랐다. 작품을 구성하는 오브제들은 도시의 구석구석에서 쉽게 발견되는 자발적으로 구성되고 전유된 공공의 장소를 재현한다. 이것은 낡고 버려지고 쓰임을 잃은 것들로 이루어져 있다. 또한 누군가에 의해 늘 돌보아지고 다듬어지면서 수명을 연장하는 공공재로 스스로를 존재하게 한다. 때때로 증식하고, 거의 대부분은 어느 날 갑자기 사라지기 위해 존재한다. 이러한 장소들은 대부분 책임지고 이행해야할 계획도 목표도 없다. 자본을 거스르고 유행을 모른 척 한다. 사회와 정치를 논하지 않으며 역사에 남겨지길 원하지 않는다. 쓰여 질 수 있는 순간에 그 쓰임을 다하고, 버려져야 할 순간에 기꺼이 버려진다. 누구든 쉬어갈 수 있으며, 누구든 만남을 기대할 수 있다. 숨겨지고 잊혀 져야 하는 것들을 보이게 하지만 과시욕을 경계한다. 너무 많은 가치들이 뒤섞여 있지만 충돌을 부추기는 긴장은 필요치 않다. 이것은 지나치게 연약하고 궁색하며 비루한 탓에 무엇과도 경쟁하지 않으며, 아무것도 욕망하지 않기 때문이다. 다만, 모두를 기다려 환대하기 위해 아주 잠시 이곳에 머무를 뿐이다. 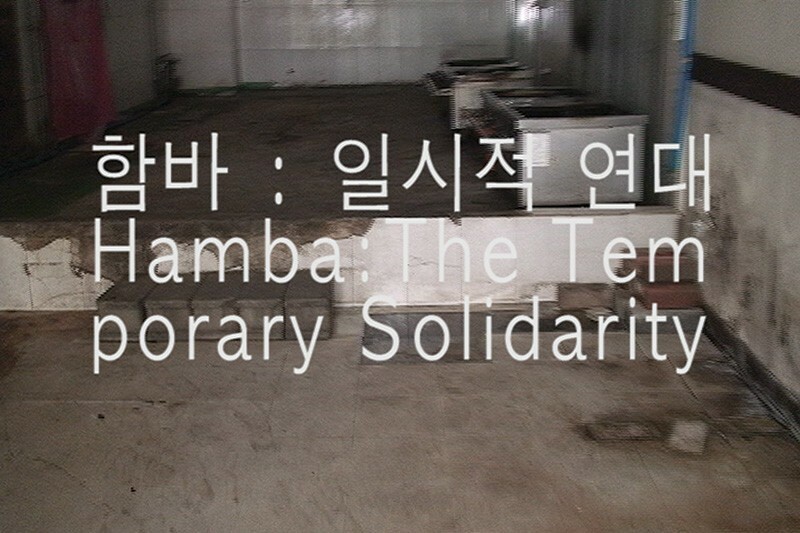 Hamba: the temporary solidarity is a project about a place and its landscape where things that do not usually occur simultaneously come to coexist; the project imagines encounters and solidarity among those that usually do not come together. The word hamba is a special term adopted from Japanese [since the era of Japanese occupation] and used on construction sites; originally, the word, pronounced hanba in Japanese, refers to workers’ loading houses on public construction sites or mines. Now, the term hambajip [the Korean word ‘jip’ means house] is commonly used on construction sites and refers to the temporary on-site restaurants that serve meals to the workers. These temporary hambajip restaurants are built when a construction project begins; their usefulness and life run out as soon as the construction is over. Hambajip, however, is the heart of any construction site where the greatest number and variety of people come and go; it is a place where people share their lives and their meals: the most universal human desire. From these contextual implications of the word hambajip, I set out to redraw the landscape of New Songdo City. Here, a paranoiac desire for modernization and development, successes and failures driven by it, and networks of small or large profits and competition, and the possibilities of reconciliation and solidarity among people are gathered and scattered. Hamba: the temporary solidarity consists of objects commonly found in the corners of an urban setting and represents spontaneously formed and appropriated public places. Consisting of old and discarded things no longer useful, public places naturally come into being as public goods and extend their lives as someone takes care of them. Occasionally they proliferate, yet most of them exist to vanish one day. Most of these public places do not have any plans or goals for which they are responsible or required to implement; they go against the logic of capital and are careless about trends; they do not discuss society and politics and have no wish to be recorded in history; they fulfill their purpose and are thrown away when the moment comes; anyone can take a rest and anticipate an encounter here; and they reveal things that should be hidden and forgotten while being cautious about ostentations. Countless values are mixed in such public places, yet there is no need for any tension instigating a conflict. This is because they do not compete with, or desire anything, for they are extremely vulnerable, impoverished and abject. They just stay briefly, waiting for everyone, welcoming them with hospitality.